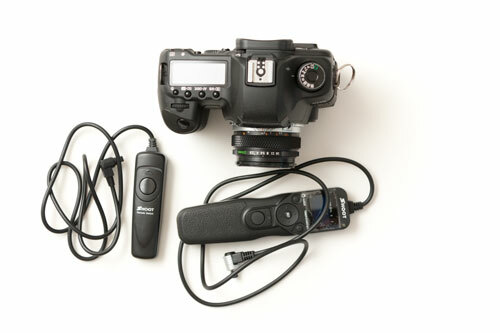 This is a brief review of the Shoot brand Intervalometer / Remote shutter release RS-80N3 and how it compares with a standard Shoot brand shutter release cable for the Canon 5D MkII camera. Unfortunately the Canon 5D MkII does not include a built-in intervalometer, so if you want to make timelapse videos, you need to purchase an intervalometer. I bought mine from eBay for £8.72. It took just over a month to arrive from China. Now, I haven't actually used this intervalometer too much, just making sure it works and shooting one timelapse sequence. And unfortunately I had to cut the timelapse sequence short due to an annoying horse that was liable to knock the tripod over. But there doesn't seem to be any other reviews of this item out there, so I can at least give my initial impressions. The first thing that struck me was quite how large the remote is. I purposefully chose the Shoot branded intervalometer remote as it uses AAA batteries, which I have a few of, and are easy to find. But I didn't think the remote would be much bigger than a standard shutter release. 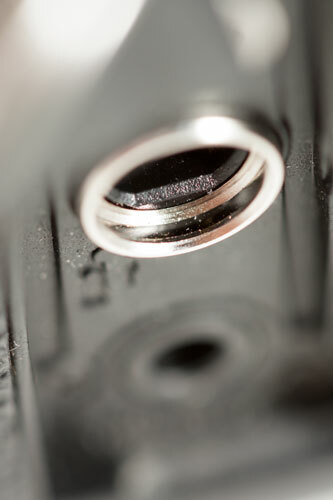 (If you've never opened up a normal shutter release, most of the room inside the casing is taken up by air). In the image below you can see how the size of the Shoot intervalometer remote shutter release cable compares to the standard Shoot remote shutter release cable and the 5D MkII camera. 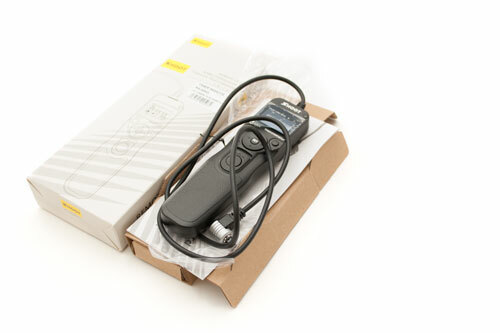 The shutter release aspect of the intervalometer remote works without any batteries. It doesn't have any on / off switch, and so is on all the time you have batteries in it. The LCD display on the remote is very hard to make out in standard light. There is a backlight button you can press that makes the screen easy to see, and should also make the remote usable in the dark. I find the standard Shoot remote shutter release cable I have for the 5D mkII often comes loose from the camera. Normally the cable plug is still in the socket on the camera, but it has loosened enough to loose electrical contact. This is quite annoying. Unlike Nikon, there is no way to screw the release cable in to secure it. But the Shoot intervalometer is much better thankfully. It secures into the shutter release socket quite nicely. In fact it can actually take a fair bit of wiggling to remove the release cable from the camera sometimes. 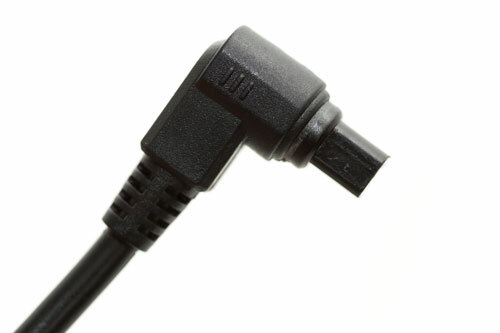 This is because the intervalometer features a metal collar on the plug that secures into the socket on the camera. The standard Shoot shutter release cable I have just has a plastic plug with no collar, and this is why it does not attach securely. The official Canon remote release also features a metal collar, which should ensure a secure fit to the camera. However, the asking price of £40 is a joke. 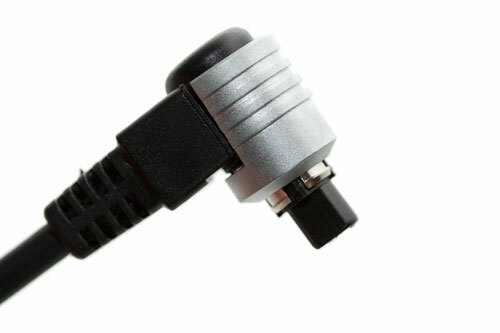 If I was looking for another standard shutter release cable, I would check the listings on ebay and try to find a cheap chinese one that includes a metal collar. One thing that I wasn't entirely sure on when I purchased the Shoot Intervalometer, was whether it offered unlimited shots in intervalometer mode, or if it was limited to a maximum of 399 shots. I am glad to report that you can set the number of images to be taken from anywhere between 1 and 399, or unlimited. So, provided the batteries last long enough, you can just leave the camera and remote to snap away all day. Personally, I wouldn't want to leave the camera anywhere by itself though. According to the manual, the battery life will give two months of continuous shooting with an interval of 5 minutes. The fact that the product comes with a manual is quite helpful. It's written in English, not perfect English, but easily understandable. One strange thing in the manual is that it shows you to insert both the batteries the same way round (which is incorrect). The release has 5 settings written above the LCD: Delay, Long, Intvl, N, ♪. On the LCD it will show a black block under the text of the current setting, and you can use the four-way controller to choose which setting you want to change. Delay sets a delay until the intervalometer starts shooting. So for most purposes you will want this to be zero. If you were setting up a camera in a remote place during the day but wanted to start shooting at night, then the delay could be useful. For setting the delay, you can set the amount of hours, minutes, and seconds. Left and right on the four-way controller allow you to move between setting hours/minutes/seconds, while up and down let you increase or decrease the amount. The maximum delay you can set is 99 hours, 59 minutes, and 59 seconds. Long is used for setting the exposure time. The settings are the same as for delay. This setting is essentially how long the shutter button is held down for. So, if the camera is in bulb mode, whatever you have set as long will be the exposure time. If you have the camera set to anything other than bulb mode, then you can just set Long to 0 seconds. If you want to take an HDR timelapse, then set the camera to continuous shooting mode. Make sure than Long is set to a value that will keep the shutter button triggered long enough for the 3 shots. E.g. If a bracket consists of shots at 1s, 2s, and 4s, then long should be set to at least 3s. The interval is the delay between the shots. According to the manual, the interval is the time between the start of one shot and the start of the next shot (e.g. for 10s photo with 7s delay between shots you should set 17s interval). But this is not correct, the interval is the actual interval (e.g. for 10s photo with 7s delay between shots, you should set 7s interval). 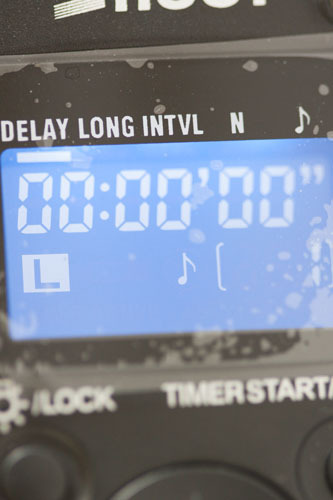 Interval is set the same way as delay and long, with the same maximum 99 hours, 59 minutes, and 59 seconds value. N is the number of shots to take, from 1-399 or unlimited. ♪ is whether the remote should beep. I prefer to turn this off. Unfortunately the remote doesn't remember any settings when the batteries are removed, and the default setting is to have beep switched on. Other than the large size, the Shoot brand Intervalometer / Remote shutter release RS-80N3 seems like a good product to me, particularly for the price. To finish off with, here are the two seconds of footage produced from the frames I took before I got fed up of the annoying horse. The video is made from 50 frames, but I think I had the intervalometer set up wrong as the delay between the images goes 1s 4s 1s 4s etc. I must have used long set to 1s, intvl set to 5s, and the camera set to continuous shooting. Shutter speed was 0.5s, so the camera took two 0.5s shots in succession every 5s. Oh well, doesn't look too bad other than the short time. Well, about a year and a half later it appears the cable has broken, and I didn't even try using it for capturing a proper timelapse yet 🙁 Where the cable connects into the camera, the cable will rotate a bit (it should be fixed), and depending on how you hold the cable, the remote won't always trigger the camera's shutter. To be honest, this failure is not entirely unexpected. I have had a lot of cheap third party remote shutter release cables where the internal wiring breaks after a time. Buying multiple cheap Chinese remotes still works out cheaper than purchasing one official remote. (And there's no guarantee that you wouldn't have the same problem with an official product either). What lens do You have strapped to Your 5D body? That’s an Olympus 24mm f/2.8 lens (the later multicoated version), attached with an OM to EF mount adapter. Nice post, I’m glad you had good luck with your connector, on my 7D the first one would not connect properly so I ordered another one (thinking it was just a one off fault. Second one was the same. I ended up cutting it off and utilising a connector from a Powertrigger. Just thought it may help someone who buys one and has problems. Cheers for the info, sounds like I got lucky with mine! Hi, do you know if this will work on the 6D? It looks like the 6D uses the same remote release cable socket as the 5D2, so it should work on a 6D without any problems. I’m trying to use this remote for time-lapse. i have the long set to 0 but when it is supposed to take one picture, it takes two. I haven’t seen that issue myself. If the camera’s drive mode is in continuous, that could be the issue. Try setting the camera to single shot drive mode and see if that fixes the issue. (If you’re already using single shot drive mode, I can’t think what the issue would be). I can’t find any company details for them online. I found the box / manual for my remote and that had no company / contact details either. So I can’t help on that I’m afraid. Given the cost of a new remote against the cost of paying for shipping to China, even if they did offer a repair service, it would probably work out cheaper to just buy a new one anyway. Lost the manual! Thank you! Incredibly clear and helpful.